glitter, vinyl and thread. 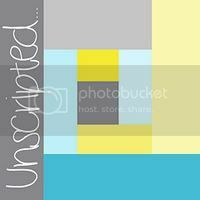 : Needlebook Tutorial! are you ready for the next tutorial? these are a fairly simple version, and they're pretty quick to whip up. needlebooks are great stocking stuffers, and it seems like you can never have too many. 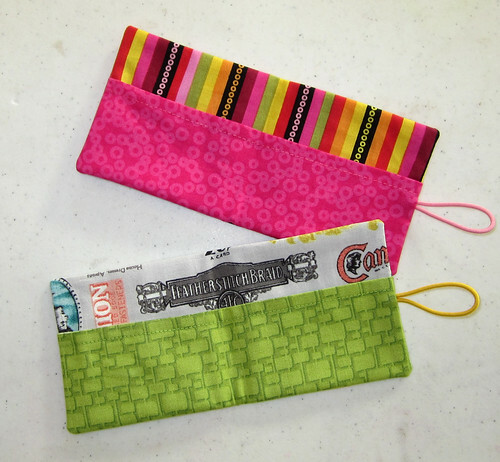 i like to keep one with each hand sewing project that i have on the go, so i'm never searching for a needle! 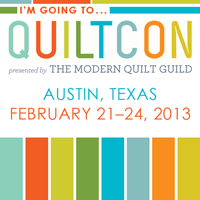 if you're making this for the VMQG, but you don't have a button, just stop after Step 13 and bring it in unfinished. i have a TON of buttons that we can use! Step 1 – Cut 2 pieces 8”x 4” of main fabric, 1 piece 8”x4” of interfacing and 2 pieces 8”x 2.75” of pocket fabric, and one piece of hair tie elastic at least 4.5” long. 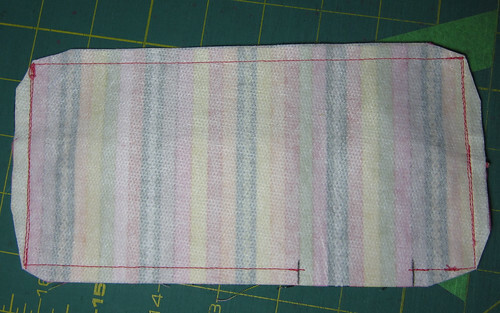 Apply interfacing to one piece of main fabric, this will be the outer piece. 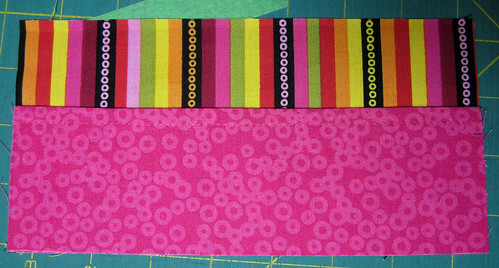 Step 2 – Stitch the two pocket pieces together (right sides together) using ¼” seam allowance. 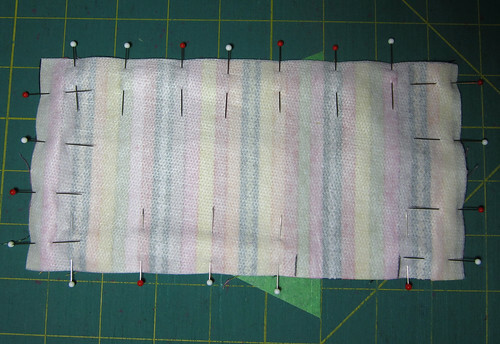 Step 3 – Press wrong sides together, topstitch, lay on top of non-interfaced (interior) fabric piece. Step 4 - Mark the centre of the needlebook short edge, on the right side. 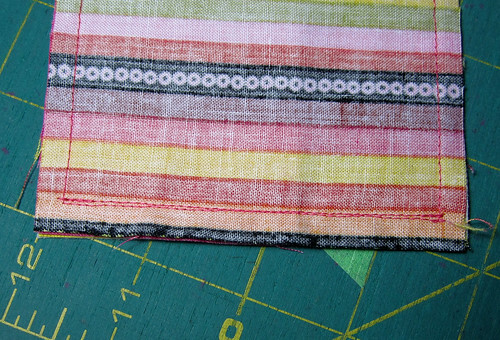 Step 5 – Burn the ends of elastic to keep them from fraying and stitch the elastic in place inside the seam allowance. 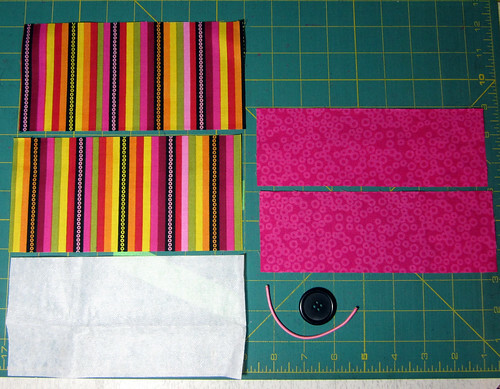 Step 6 – Lay the interfaced piece on top of the pocket and interior pieces, right sides together. Pin around the edges. 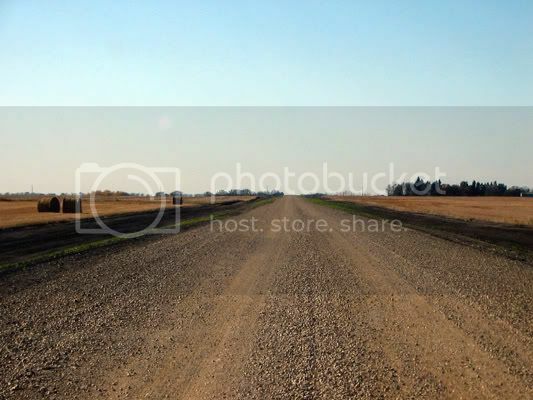 Step 7 – Leave an opening on the bottom right side, this will be the most inconspicuous spot. 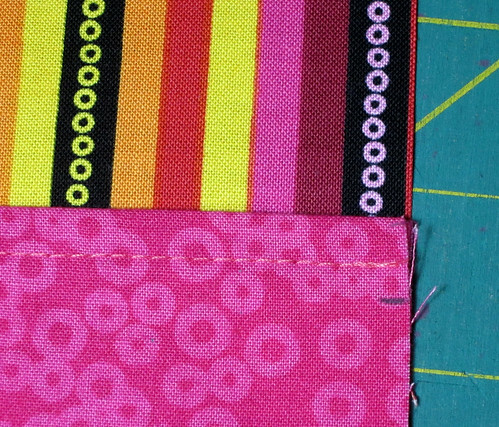 Step 8 – Sew all the way around, stopping and starting at the opening. 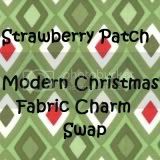 Use a 1/4” seam and a short stitch length. 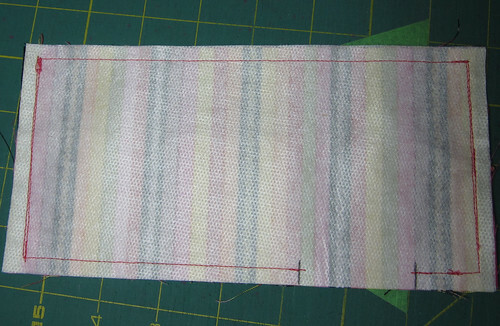 Step 9 – If you’re using a striped fabric or something with a very distinct pattern, it will be obvious if your seam allowances are the slightest bit off, so you might want to straighten them out to match the stripes. 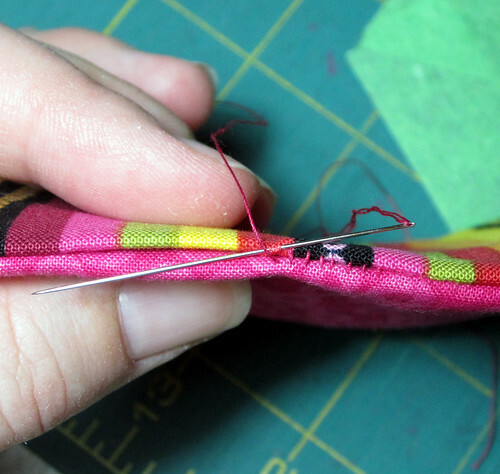 Step 10 – Trim the corners, being careful not to cut your stitches. Step 11- Turn right side out through the opening that you left. 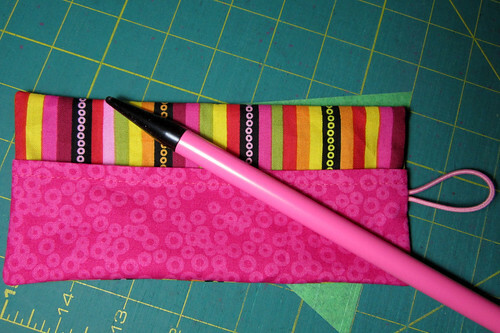 Use a slightly rounded tool to push out your corners, such as a knitting needle. If you are using a pointier tool, be sure to push from behind the batting, so that you don’t accidentally push through the fabric. Step 12 – Press flat, aligning the edges of the opening. 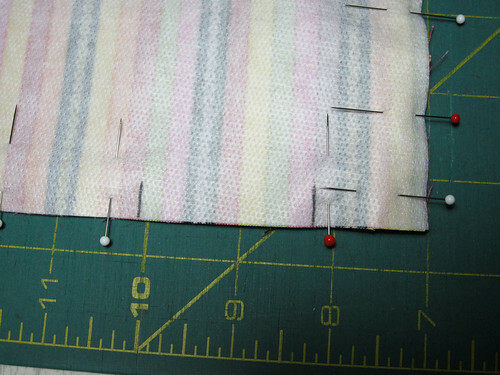 Step 13 – Hand stitch the opening closed using a ladder stitch. Tie a knot once you’ve stitched it closed, and pull the knot into the seam allowance to hide it. 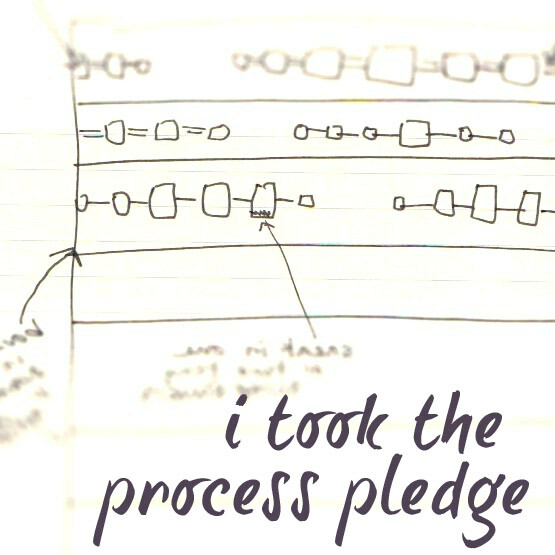 Step 14 – Do you have a button? Remember, bigger is better, and use a nice-looking button, since it's kind of the focus of the needlebook. 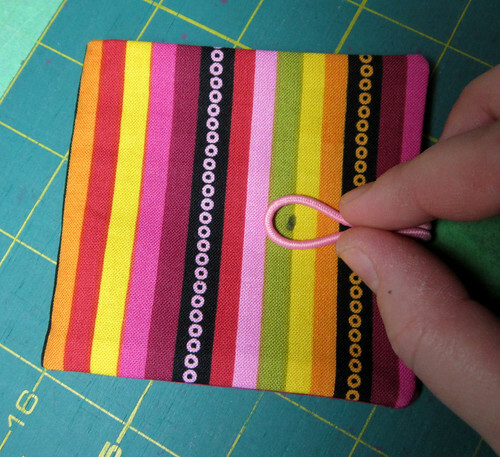 Fold the needle book in half, and fold the elastic loop over the front of the book. Using a marking pen that can be erased (I’m using a Pilot friXion pen, which is erased by heat), mark where the button will go. Step 14b – Because of the centre positioning of the button on the front, your sewing will be hidden by the pocket, but we still want it to look as nice as possible. Part of the way that you’ll do that is by using an invisible knot to start stitching. Cut one long piece of thread, and fold it in half. We’ll be working with a doubled needle to sew the button on. However, unlike the traditional doubled needle, we’ll be threading the needle eye with the two ends of the thread, and leaving the centre fold free. 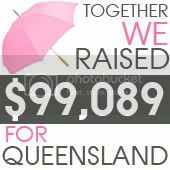 See the picture below? 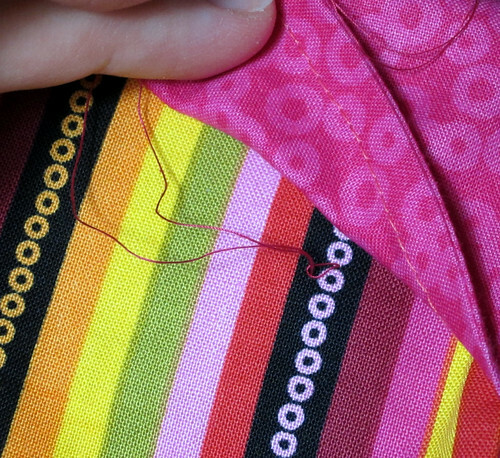 Step 14c – Pull your needle through from back to front, just to the side of the marking that you made on the front. Leave the loop on the backside, and be sure not to tug the thread right through! 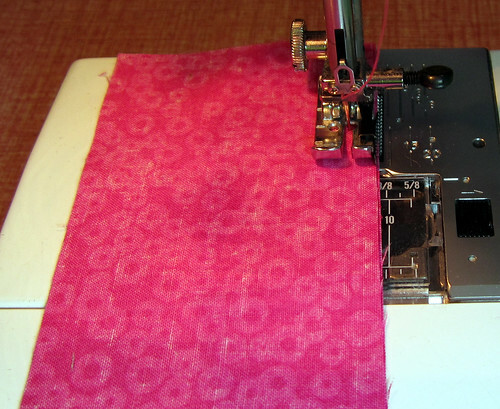 Thread your button onto the needle, and pull the needle back through to the backside. As you do this, pull your needle through the loop that you left, securing it in place. 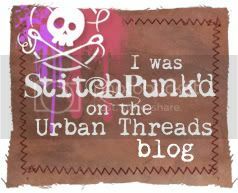 And then just sew the button on as usual! 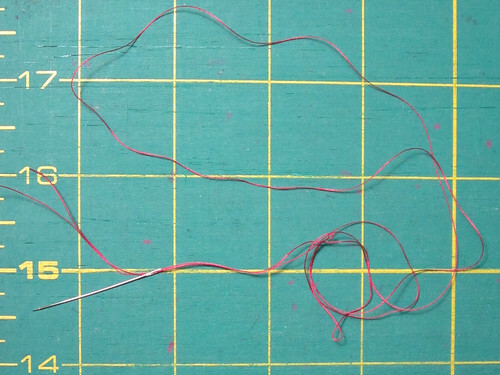 Step 14d – Once the button is secure, tie a small knot, and then thread your needle through the stitches that are holding the button on and tug the knot under the stitches to hide it. Step 15 – Bring your needlebook to a meeting or a sew-in, and we’ll finish it off by adding a rectangle of wool to the inside. cut a piece of wool felt 3"x 7". 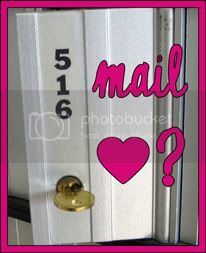 if you have pinking shears or a pinking blade for your rotary cutter, pink the edges to make them look nice. centre the felt inside the needlebook and pin carefully. 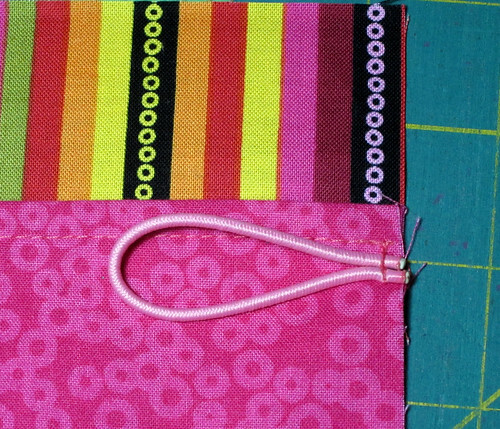 sew a line of stitching down the middle of the book. 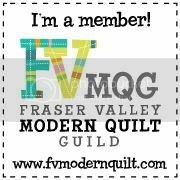 if you're not confident in your straight sewing abilities, i'd suggest marking the centre line on the outer, non-fuzzy fabric. Pilot FriXion pens will leave a "ghost" marking on coloured fabrics, so don't use it! if you don't have a different marking pen, use a strip of painter's tape and sew along the edge. hmmmm, i think you are right, I do need a few more needlebooks! I have two, but I always seem to be looking for them, so a few more and I won't have to look so long before I come across one of them! Thanks for the tutorial, I didn't think of putting that pocket in, before. They are great, but I already have an amazing Melody Miller one made by your fair hand! They both look so cool! 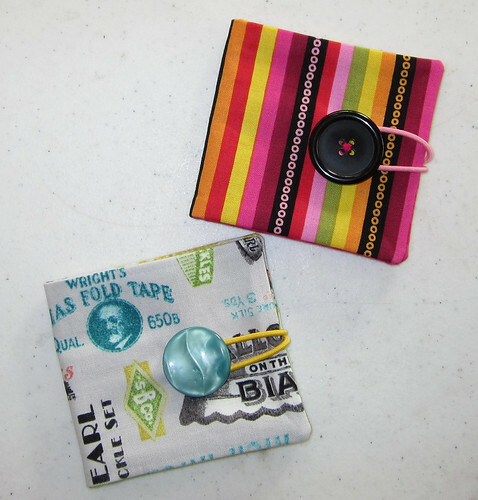 It's always great to have fun practical things in your sewing kit! Hi Amy. Great tutorial. I've been meaning to make a needle case for my carry along projects. I always learn something really useful from your tutorials , you give great directions which is not always easy to do. 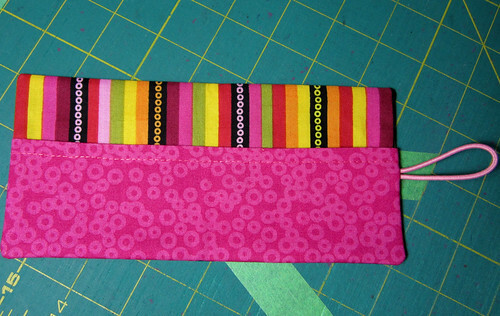 Needle cases are so fun, think I need to make one.